Protect, organize and transport your paints, brushes, tools and supplies in this classic version of the traditional tool box. 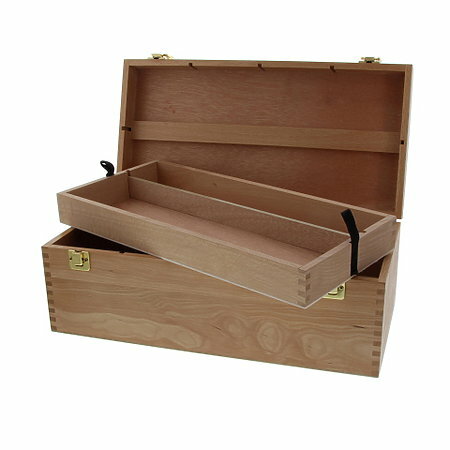 This elegant, unfinished wood box is constructed of hardwood with veneer, using finger-joint construction. It is light-weight yet sturdy, and it features brass hardware and a durable handle. Eight separate, removable storage dividers provide versatile organization. The top storage tray lifts out for easy access to supplies stored below. Chest measures 16-1/8" x 8" x 5-7/8".